If you are interested in on of our puppies, or a particular litter, please fill out the form below. Fill in every field, in order for us to best match you to a particular puppy or litter. Thank you for your interest. Too many spammers use Yahoo addresses, so they are being blocked by both Yahoo and Gmail. In which type of retriever activities are you involved? Which titles/accomplishments have your retrievers achieved? Do you currently use a professional trainer? 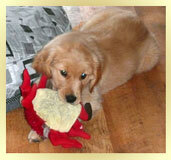 No matter who your trainer is, we recommend someone who is familiar with Goldens, and enjoys training them. Are you interested in learning more about the Retriever / Hunting Dog training programs we offer at SkyRiver Goldens? Some field Goldens produce puppies with small white patches on toes, head, or chest that normally disappear with age. Are you opposed to ANY small white markings on your puppy? I understand all information contained herein, and I certify that all information contained in this form is true and correct.